Giles and Esmond Romilly were the nephews of Winston Churchill and Giles Romilly married Jessica (Decca) Mitford, one of the notorious Mitford girls. They both attended traditional Wellington College, where they rebelled against the military and disciplinary traditions of the time. There was fear that this august school was subject to the corrupting influence of Moscow, as the Romilly brothers produced a left-wing magazine entitled Out of Bounds: Public Schools’ Journal Against Fascism, Militarism and Reaction. Several issues appeared and then Esmond ran away from school to work in a Communist bookshop, causing sensational headlines and adverse publicity. Giles, although a rebel, stayed on. This is the story of their schooldays, first at Newlands and then at Wellington, which was first published in 1935 and has been out of print for many years. They recount the story of their early years and their rebellion with skill and panache. 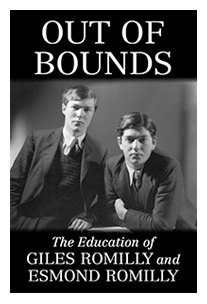 Out of Bounds shows the authors political thoughts and beliefs and serves as a moving picture of the struggle against the education, politics and social mores of the 1930s. There will be a foreword by Edmund Romilly, Giles’ son and an afterword from Dr Patrick Mileham, the archivist of Wellington College and a distinguished author. Esmond Romilly fought in the Spanish civil war, eloped with Decca Mitford and was killed when his bomber plane was shot down in 1941. Giles was captured and incarcerated in Colditz, eventually escaping and becoming a journalist before moving to California, where he died in 1967. Long out of print, with copies changing hands for £200, this timely new edition will create extensive review and feature coverage including the Mitford family connection. World rights.